He’s a “chef in transit,” a “food consultant, coolhunter, recipe & concept developer, lifestyle journalist,” it reads in his Instagram bio. He elaborates on Twitter: “food pimp, author, indie, baker, butcher, spelling bee, mama’s boy, geek, original hipster, mr fix it, songwriter, occasional tv star.” What’s missing? Oh yeah, his architectural design degree. These disparate interests all inspire and inform his passion for baking. His New York City restaurant and bakery (P*ONG and Batch) closed in 2009 and since then he’s picked up consulting gigs, as well as a guest appearance as a judge on Top Chef: Just Desserts in 2011. 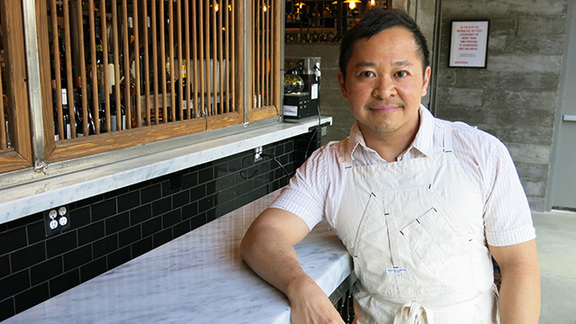 If that was the conclusion of “Act One” of chef Pichet Ong’s story, his second act is just getting started. We caught up with the chef recently to see what he’s been up to and what his next plans are. Chefs Feed: You’ve been traveling a lot recently. Has it been for work or pleasure? Pichet Ong: Yes, I’ve been traveling mostly for consulting work, but it’s nice to just get away, too. I have family in Thailand, DC, Los Angeles, San Francisco, Shanghai and Myanmar—all over the map. Since I don’t have a home base right now, I’m taking advantage of that. CF: Why did you decide to go into consulting? PO: I opened up a restaurant and bakery in 2006 and closed it in 2009. For many reasons. I went through a divorce. My mom had a stroke. 2008 was a tough time for me. Financially, I had to recover from that. So when that restaurant closed, I needed to take a break and spend some time with my mom and dad. I needed time to catch up on myself and to regain my wealth again and connect the dots. It was important to take a break, but other people started to seek me out for things like Top Chef Desserts. It was good fortune for me because it’s hard to find temporary work. I’m grateful that I have more work than I can handle now and the opportunity to see the world, which I couldn’t do before for time restrictions or money. CF: What sort of consulting projects are you working on right now? PO: I do consulting for many restaurant groups, among them are Yerba Buena, Coppelia and Qi. I also do product development consulting for Häagen-Dazs. CF: Häagen-Dazs? What do you do for them? PO: We’re testing out flavors for the Asia and Europe markets. CF: How are people’s tastes for ice cream different in other countries? PO: America has a very simple palate. I don’t know how to say it without sounding mean, but Asia likes more interesting flavors. They have more interesting or seasonal products, like passion fruit, which don’t do well in America. CF: Are you thinking about opening up a new restaurant in New York City? PO: I know I want to open my own shop and am exploring opportunities outside of New York City for a change because I’ve been there for 20 years. As much as I love it, I want to explore other scenes. Other cities have thriving food scenes, too. I have been doing pop ups in L.A., DC, S.F., Baltimore, Austin, Houston, Portland (Oregon and Maine). It’d be nice to have an open canvas. PO: No, an open canvas. I need a community to work in. There’s no such thing as a blank canvas. CF: Will it be focused on desserts? PO: I think it has to be dessert centered, because that’s what I love. It depends on the space and the city. A restaurant is contextual; you can’t just open it up anywhere. A restaurant in L.A. would be different from one in Texas. CF: It’s interesting you say that. In his new cookbook, chef Corey Lee talks about how Benu is very much a product of San Francisco. PO: I can see that. The food at Benu is very authentic (Asian-inspired) and there’s also something whimsical about it. CF: In addition to your consulting work, what have you been up? PO: I’ve also started doing a little bit of writing. Some of it anonymous, some known. I write for Food Republic about my travels. When you’re a chef, you’re stationed and working in a kitchen, creating your own dishes, but being a chef is also about traveling. I document what I eat, including street food or snacks that locals are eating. I’ve been sharing that through Instagram. I like to branch out from food. You get inspiration from other things, like art, design and fashion. CF: How did you get into fashion? Fashion is something I’ve always been curious about. It’s also relative to everyone. A lot of people think fashion is about couture and elaborate designs, but functionality is also fashion. I’ve always dressed how I like. I’m not a typical New Yorker because I don’t wear just black. I like colors, textures and layers. Now you see hipsters wearing beanies and colors, too. CF: How does your architecture and design background influence your cooking and baking? PO: Architecture taught me to look at context. When designing, you study and evaluate your environments before you apply design. In addition, there are conditions such as size, use of space, what the clients want, what came before and after. When it comes to cooking and baking, it isn't much different. Initially, the creative process for both are very tactile—you use your hands a lot—just the materials vary. When designing a menu, I think about what is in the seasonal pantry, the type of dishes the savory chef makes, the style of service and the restaurant. On a deeper level, cooking and baking today are all about deconstructing a tried and true recipe and reconstructing it in your own way, with your own language, in the given new context. CF: Baking from scratch can be intimidating to the home cook because of the precise measurements and patience it takes. What advice would you give to the novice home baker? PO: I'm a big fan of measurements and precision when it comes to all cooking. I almost always start off with a recipe based on proportions that I sketch out beforehand. But ultimately a recipe can only take me so far. When it comes to putting it all together, instinct takes over. Better instinct comes with practice and repetition, but along the way, tasting every step is the best way to ensure a more delicious result. A finished product will taste good if it tastes good before going in the oven or fridge to set. This way, it also ensures you don't forget to put in the sugar, salt or flavor component. CF: If you could travel anywhere in the world, where would you go next and why? I would love to go to India. As it’s probably evident in my Instagram account, besides architecture, food is a primary subject of consideration as to where I choose to travel. I grew up in Singapore and have had a lot of Indian meals in the U.S., but I have never been to India yet. I'm pretty sure the sights will move me immensely. I will need the right travel companion and a good amount of time. CF: Is there a restaurant you've never been to yet, anywhere in the world, that you would still like to visit one day? Globally, Chinese food is evolving slowly but surely—but in China, it's a different story. Each visit is an eye-opening experience for me. So many mysteries to unravel, so much technique to see and flavors to taste! I would love to go to Chéngdū and eat at Yu's Family Kitchen. I've had the pleasure of working with Chef Yu Bo at culinary conferences from Spain to Australia and at the Culinary Institute of America at Greystone, but I have not been to his restaurant. It's next on my list. CF: How can people keep up with what you’re doing? I’m a chef who was around pre-Twitter but I use Twitter as my resume. People often find me that way. I love Instagram, too, and use it a lot, but I don’t have a proper website. I feel fortunate that I can promote myself this way—and I promote everyone else when I eat at their restaurants by tagging them.